Bender UK is now the exclusive supplier of the new Q Flow™ LED surgical lights, developed by Merivaara of Finland. Bender UK is now the exclusive supplier of the new Q‑Flow™ LED surgical lights, developed by Merivaara of Finland. The new range will be launched in the UK at the Operating Theatre Conference 2017: The Future of Surgery, in Manchester on May 23rd 2017. Merivaara lights form part of Bender UK’s comprehensive range of healthcare products and services which includes critical care IPS/UPs power solutions, surgical equipment, turnkey theatre packages, service and technical support. Colour rendering is vital for surgeons and theatre staff to monitor the health and well-being of patients, and Q-Flow™ has achieved best-in-class 99% for R9 and R13 values and 98% for Ra values in independent DEKRA tests. The sleek, streamlined construction is designed to optimise laminar air flow which dramatically reduces the danger of contamination at the operation site. The objective of laminar air flow is to deliver an uninterrupted vertical flow of sterile air to the operating table minimising the turbulence which can introduce bacteria. Standard turbulence intensity should be below 37.5 % but the Q-Flow delivers 15.9 % according to the DIN 1946-4:2008 standard. Merivaara has developed the innovative Dynamic Obstacle Compensation (DOC™) system to minimise shadows in the light field. Steve Coleman Bender’s Clinical Sales Manager has demonstrated the Q-Flow™ system within UK hospitals and reports that clinical staff immediately appreciate the advantages offered by the DOC™ system. The long (750mm) column of white light generated by the Merivaara Q-Flow™ lights is always in focus. It is the only light that adjusts its illumination output to offer full illumination (160 klux) at largest and smallest light fields ensuring light intensity is consistent at all focus points. Illumination output of other systems can drop by as much as one third as they focus down. 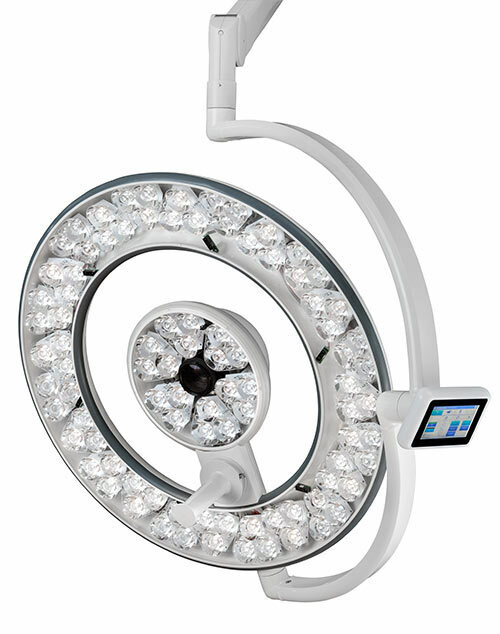 The widest light-field diameter range in the market, illuminating the full surgical light field and minimising the need for light repositioning and preventing excess glare. A smooth outer surface making it easy to clean, enhancing hygiene performance. IP65 rating offering excellent protection from fluid and dust ingress. LED pilot laser to guide the centre of the beam to the operation site - activated by surgeons grip on he the Intuitive Sterile Surgeon Control (Intueri™). Wireless camera compatibility for a full HD (1080p) In-light Camera providing excellent image resolution for live/recorded transmissions, and a wired 4K resolution in-light camera. Up to 50,000 hours operational lifetime; at a user rate of 10 hours a day/5 days a week - LED’s have a potential life of 1,000 weeks.